I know I'm a few days late on this one- a bunch of y'all emailed me back on Monday when the reveal article was published on the FFG site, but with my work schedule last weekend and the Huge ship rules stuff taking precedent, this is kind of the first chance I've really had to talk about the E-Wing. First though, I want to talk a little meta. 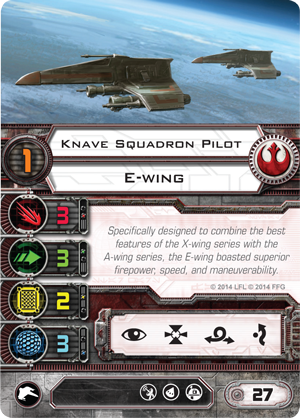 We discussed on here before that a lot of the more recent releases and reveals seem to be focused on trying to make low count squadrons viable again. Or more viable than they currently are. Or hey, if you're a cynic, getting rid of the dominance of the TIE Swarm. The Defender seemed to be a pretty good head fake in that direction, but I've seen a lot of Imperial type folks not exactly getting behind the notion. And hey, with good reason. For one, the Swarm is still quite viable as we've discussed on here before, but also because those Swarm players have quite a bit of dough wrapped up in their Swarms, not to mention a lot of hours flying them. Trying to talk them out of what they know is kind of asking a lot. That said, I think trying to sell Rebel players on the idea of a two or three ship list rather than a four or five ship list is a much easier sale, hence the E-Wing. Stats-wise, the E-Wing is the most capable Rebel starfighter out there. While it's not quite as fancy as the Defender, it's no slouch either. More or less, it's an X-Wing with an extra green die, and having the ability to throw down three greens at any given time is nothing to sneeze at. Perhaps more importantly, it's the subtle switcheroo between the hull and shields when comparing the E-Wing to an X. Still the same 5 hit points, but with three Shields, you've got one more hit before cards start flipping faceup and counting. Again, not a massive difference, but one that you will feel after a few games with the E-Wing I think. 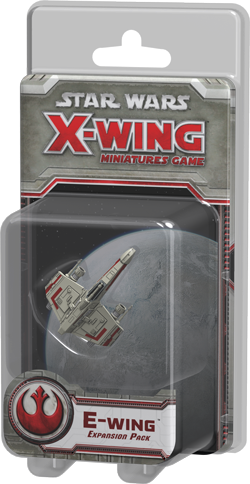 The E-Wing is also the only Rebel Starfighter besides the A-Wing to feature 4 Actions stock in the Action bar. While most folks make their living with Focus and little else, the E-Wing features the other Rebel standby Action Target Lock, as well as Evade and Barrel Roll. Much like the switch between Hull and Shields, I think this is another subtle advantage that people will really start to catch on to once they've played around with the E-Wing. Remember that list I made back in Wave 2 that was centered around the notion of Action passing and why it didn't work as well in real life as it seemed to on paper? This is a ship that would benefit tremendously from being part of a list like that. Rebel lists featuring Squad Leader are/ were relatively uncommon, because with only having two Actions available on most Rebel ships, there's kind of a limit to what you can do when you can't pick the same Action twice (especially when you've got other pilots like Dreis and Dutch available). With these guys having so many more options though, now you can start to imagine lists featuring not only Squad Leader, but also stuff like PTL, as well as maybe even Lando. I know, I know, you're thinking you'd never take Evade and you don't really ever Barrel Roll in your Action phase if you're a Rebel player, but dig what I'm saying here- you probably would still take Focus for your 1st Action, but what about your second Action? What about your third if you could snag one from a ship throwing around Free Actions? 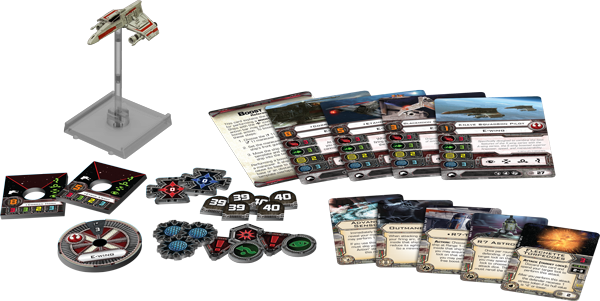 We tend to kind of look at stuff like this in a vacuum in these previews because we've not pushed it around on a table just yet, but I think an E-Wing will be a nice compliment to some Rebel pilots and upgrades out there that just aren't seeing much playing time these days. The E-Wing also sports the potential for some very interesting upgrade combos too featuring both an Advanced Systems slot and an Astromech slot on even the generic pilots. Throwing on a System Upgrade like Sensor Jammer, then pairing it with an Astromech like R2-D2, R2-F2, R7 Astro, or R5-P9 is going to be very hard to kill outright with those upgrades as well as the three Defend dice. God help your opponent if you decide to invest in a Stealth Device or Shield Upgrade on top of that. The named Pilots have both been revealed for the E-Wing as well. 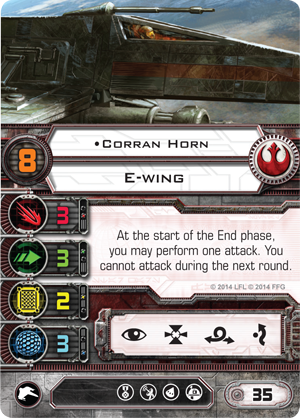 We talked a bit about Etahn A'Baht in the initial Wave 4 reveal article, but Corran Horn is now a known quantity too. He ain't cheap, but he has high Pilot Skill, an Elite Pilot Talent slot, and a very interesting bit of card text to go along with everything an E-Wing already brings to the table. Effectively, you get to make two Attacks in the same round with Horn, but then you sit out the next Combat Phase. To me, this screams for Upgrades that aren't Actions so you can really maximize that second Attack, should the opportunity present itself. Opportunist seems super nasty on this guy since his target probably won't have any Evades or Focuses left at the start of the End Phase, as does the unreleased Predator card since E-Wings are supposed to be super maneuverable and will probably have a pretty capable dial. Of course, if you're concerned, you could always take an Engine Upgrade as your Modification. So there ya go- very expensive, but pretty capable in a lot of ways and undeniably difficult to kill pretty much sums up the E-Wing, at least at this point.